An important piece of the puzzle for the 2017 season is finally in place for the Los Angeles Angels. On Tuesday, the club activated versatile infielder Luis Valbuena from the 10-day DL. Valbuena missed the entire month of April after suffering a hamstring injury towards the end of spring training. 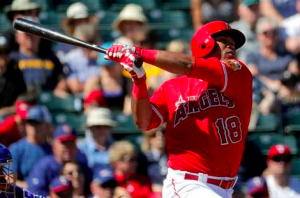 He is finally poised to make his debut with the Angels, who should be excited to have him back amidst a slew of other injuries that have hampered them during the first month of the season. Valbuena was one of several everyday position players the Angels acquired over the winter, and he may have been the one with the best chance to make a major impact on the club. Despite missing the final two months of 2016, Valbuena hit .260 with 13 home runs for the Astros, posting a career-high .816 OPS. The Angels were hoping he would provide a left-handed bat with some pop to complement an otherwise right-hand heavy lineup. Of course, those plans went awry when Valbuena was diagnosed with a Grade 1 hamstring strain in March. Outside of Mike Trout, no one in the Los Angeles lineup has shown much consistency this year, putting the Angels towards the bottom of the American League in most offensive categories, including total runs and home runs. After going 8 for 23 (.348) with three doubles in six minor league rehab games, the Angels hope Valbuena is able to hit the ground running and give the team an immediate boost. Upon his return, Valbuena figures to find himself in a platoon at first base with Jefry Marte. C.J. Cron has received a majority of the playing time at first base this year, although he was placed on the DL over the weekend with a foot injury. His absence makes the return of Valbuena all the more important. Ultimately, Valbuena may end up in a platoon at first base with Cron, who’s hitting just .218 against right-handed pitching this year. Valbuena is also capable of playing third base, where Yunel Escobar has gotten off to a sluggish start for the Angels this year. He could also play second base, which is another problem area for the Angels, as Danny Espinosa is hitting just .170 on the year. No matter where he lines up in the field, Valbuena should end up being close to an everyday player for the Angels as long as he remains healthy. With Trout receiving so little help around him, the Angels desperately need Valbuena to emerge as one of their most reliable run producers, at least until the rest of their lineup can break out of an early-season funk. To be fair, the Angels have done well for themselves, winning six of their last seven to go a game above .500. However, the Angels currently have eight pitchers on the DL, including their top two starters in Garrett Richards and Tyler Skaggs, as well as two key relievers in Huston Street and Cam Bedrosian. This means that more than ever, the Angels need their offense to carry them. Valbuena can help make that happen, and so the Angels will be excited to finally have him in their lineup on a daily basis.